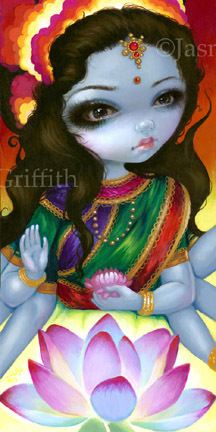 Inspired by my recent trip to India, here is a painting based on Hindu devotional imagery of the Hindu goddess Lakshmi! Consort of Vishnu, she is a goddess who brings luck and prosperity. In India I saw a lot of Hindu devotional artwork - often popping up in the strangest places, on the backsides of trucks, in advertisements and music videos, in temples, posters plastered onto alleyway walls - all so lovely. This piece was painted from Dragon*Con 2013 where it won the 2nd place "Best in Show" award. The original painting herself is sold, but I have prints available online and through my gallery. Jasmine is attending the KC Renfest again this weekend! Sept. 14 & 15th, and October 5 & 6th! I open up at 10:00am Saturday & Sunday! And now - we have my new "Owlyn" cloth dolls here too! I may even be painting - I'm bringing my easel. I'll also have original mini paintings for sale today! Yes, I'll be there in person for the above weekends at the Kansas City Renaissance Festival! 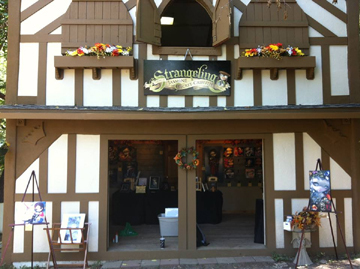 Definitely stop by to say hi - get autographs, see new prints as they debut, chat about art, and enjoy the KC Renfest! Our house is shown above - a two story half-timbered Tudor style house with the Jasmine Becket-Griffith logo above the door, and Jasmine art out in the front yard. The booth number is #251 on Westover Way (previously this was Nene Thomas' house, so if you have been to the Festival before you will find it!). I will be there all day, every day in person the days posted below, and on all other weekends my sister Amber & her husband Chris (you know them as Strangeling Emporium) will be running the shop in my stead, so whenever you come to the Festival we will be open!